Share the post "Album review: CANNONBALLZ – 8Ballz2Many"
Andrew McNeice and his MelodicRock Records label have released some top quality AOR releases in recent years including Don Barnes and the excellent comeback album from Boulevard, now you can add to this Cannonballz. Who you may ask? Well after recording a few records with various well-known musicians, guitarist/songwriter Alan Friedman wanted to form a band with his favorite drummer, bassist, keyboardist and vocalist. So he enlisted drummer Jonathan Mover (GTR, Marillion, Alice Cooper, Joe Satriani), bassist Doug Wimbish (Living Colour, Jeff Beck), keyboardist Vince DiCola and vocalist Robbie LaBlanc (Find Me, Fury). Robbie LaBlanc has a wonderfully expressive set of pipes, perfect for the songs on here be it the Mr. Big like opener ‘Sari’ or the Toto flavoured ‘Just In Time’. 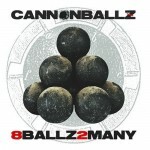 Cannonballz recall the Joseph Williams Toto era on this one (and ‘Never Giving Up’), especially that band’s ‘Fahrenheit’ album. There are plenty of jazz and instrumental break outs throughout, the highlight being the rip roaring piano that rounds off ‘I’ll Take The Pain’. Mind you the Hammond solo on ‘Lost In Time’ is another listening joy. Vince DiCola certainly leaves his musical mark throughout the album. Alan Friedman shows his musical chops on the various guitar solos, the pick for me is the Jeff Lynne/Travelling Wilburys approved solo on ‘When I Think Of You’. The whole band each get a solo on the instrumental ‘URanus MYanus!’ including a funky bit of playing by Doug Wimbish and that man again Vince DiCola trading solos with Alan Friedman. ‘T.N.K.’ closes the album, the band’s take on the Beatles song ‘Tomorrow Never Knows’. They keep the original’s psychedelic feel, adding in a bigger rhythm and plenty of keys. Interesting cover, although not sure it fits in with the overall sound of the album. This entry was posted in ALBUM REVIEWS, ALBUM REVIEWS (Mobile), All Posts and tagged 8Ballz2Many, album, AOR, Cannonballz, Jazz rock, melodic, melodic rock, MelodicRock Records, review, Robbie LaBlanc, Toto. Bookmark the permalink.